It would seem that the first and most logical thing to decide when deciding how to choose the front door to the apartment is to buy it with a wooden or metal leaf - but there can be only one answer. Modern realities show that extremely uninteresting neighbors often live in an apartment building, which apartment thieves, who usually take quite a bit of time to get inside, enjoy with pleasure. Particularly pleased with these comrades is the presence of a wooden door, because any of them is relatively silent and in a matter of seconds is broken out of the hinges from the hinges, against which even the most complicated lock is powerless. As a result, the door must be steel, which under any circumstances will force the hacker to spend at least half an hour on opening it, and therefore, with a high degree of probability just to abandon this venture. 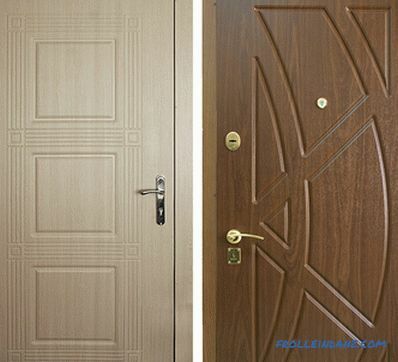 The main issue has been resolved - then we will analyze in detail how to choose the entrance metal door to the apartment. 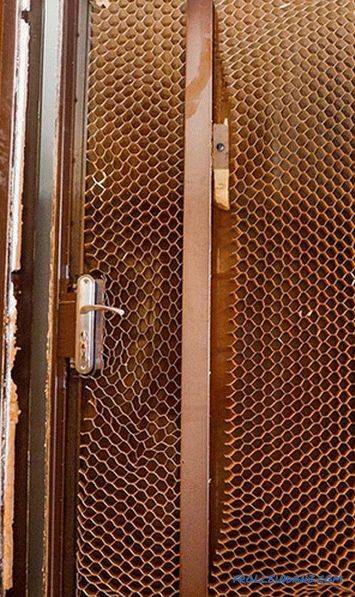 From the point of view of reliability, metal doors should be selected according to the following criteria: the thickness of the metal profile (base), the thickness of the outer steel sheet and the presence of ribs. On the one hand, the more these values ​​are, the stronger the door will be. On the other - for the same reason, an unjustified increase in the weight of the whole structure is possible, resulting in large inertia when it is opened and quick wear of the loops. At first we will consider from what elements the qualitative entrance metal door should consist. From the U-shaped profile, a closed door frame is assembled onto which a steel sheet is fixed by spot welding. On the inside, quality doors have stiffening ribs - at least two vertical and three horizontal ones. Depending on the location of the lock, the middle rib may be solid or split in the lock zone. Depending on model of the lock, crossbars and their drafts, and also castle armor plate are placed. Between the ribs is embedded insulation. 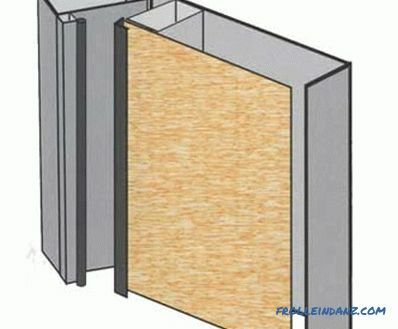 From the inside, the door is closed by a MDF panel or other suitable material. On the door frame, the door is hinged on the hinges with bearings - others simply cannot bear its weight. 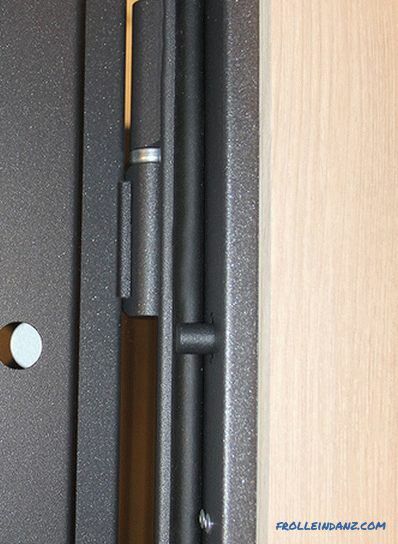 An additional protection against breaking the door out of the box is an anti-detachable pin, which slides out of the door leaf when it is closed. 5 . Armored plate on the lock. 9 . Hinge with bearing. 10 . External clamping plate. 11 . A metal sheet. There are many types of door frames. 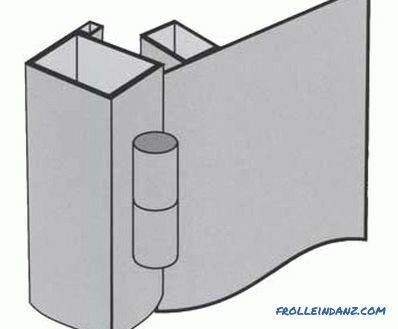 The most common are boxes made of a corner, a shaped tube and a bent sheet. The best option for its manufacture will be a profile tube with a metal cross section of 3-5 mm. 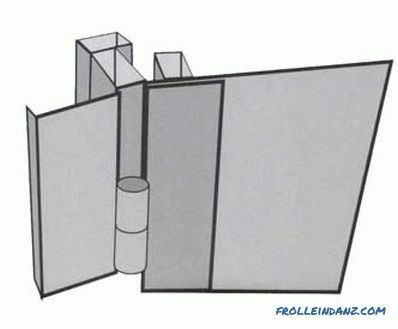 The use of boxes made of a corner or a bent sheet is not recommended, since these structures are more susceptible to twisting and bending deformations. 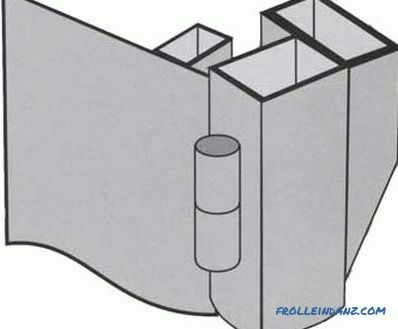 Profile pipe, in addition to greater stability, easier to install and better fixed in the wall. 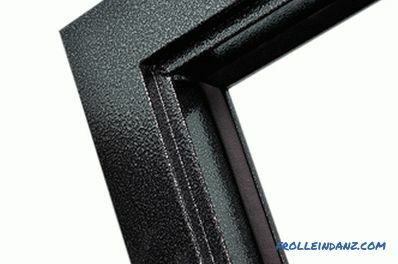 Door frame made of shaped tube 50 * 25 mm and 16 * 4 mm. Door frame of 50 * 25 mm profile pipe. and 40 * 25 mm. A box made of shaped tube 60 * 30 mm. and 16 * 16 mm. Door frame of 50 * 25 mm profile pipe. and 40 * 25 mm. with armor stripe. Boxes from a bent sheet have good sound and heat insulation, but lose to boxes from a profile pipe by strength. The mounting plates are welded to both racks of the door frame, with which the box is fixed in the opening. The number of mounting plates, as a rule, from 3 to 4 pieces on each side. One of the vertical uprights of the door frame is carrier, door hinges are welded to it and holes for anti-detachable pins are made in it. The second pillar is a locking one, and holes are made in it for the lock bolts. An important element of the box is the door porch. This quarter serves to install the seal. There are boxes with one, two and even three arches. As practice shows, in the presence of a good compactor, one of the porch is enough, everything else will be superfluous and entail overpayment of funds. The next important element of the door frame is the trim. In addition to decorative, they perform a protective function. Shutting off the assembly seams, they prevent intruders from penetrating to the mounting elements and do not give the opportunity to get a crowbar behind the rack of the box. Specified by the width of the profile from which the door base is made. The standard size for an apartment is about 50-70 mm, and if a street door is made, then its thickness can be increased to 100 mm. 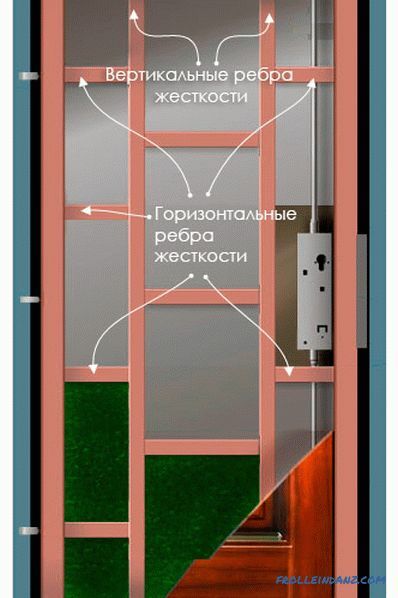 From the point of view of reliability, safety and insulation properties, the thicker the door is the better, but the increased inertia will make it more traumatic, so it is better to stay at the option close to the standard. It is on these elements that the resistance of the door to cracking and its weight depends. Sheets with a thickness of 0.5 to 1.5 mm are welded onto cheap door leaves, most of which are opened with a can opener without too much difficulty. It is also not recommended to make the thickness too large, since from a certain moment only the weight of the door rises without increasing its protective properties. 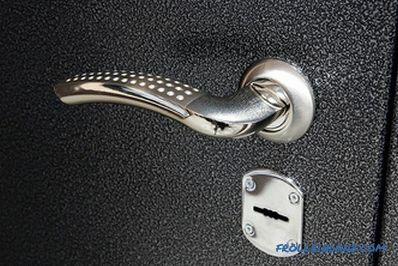 The golden mean is the size of 2 - 3 mm, which provides good protection of the lock and comfortable use of the door. 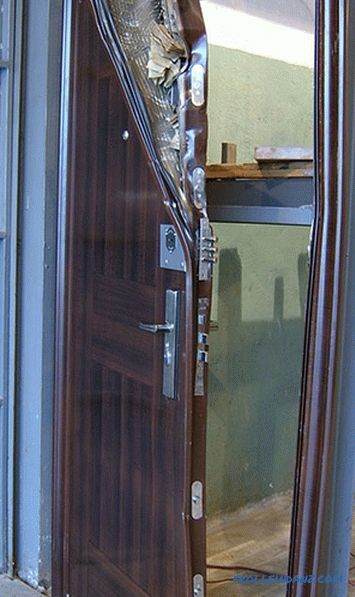 Some manufacturers offer allegedly reinforced doors as a marketing move, on which there is an additional steel sheet on the inside. Undoubtedly, this somewhat increases their durability, but by and large, it is inexpedient, since the burglar can cope with the outer sheet enough to penetrate the apartment. An additional disadvantage of this design is found when it is necessary to repair the lock, access to which is either blocked or possible only through a specially cut out hatch. 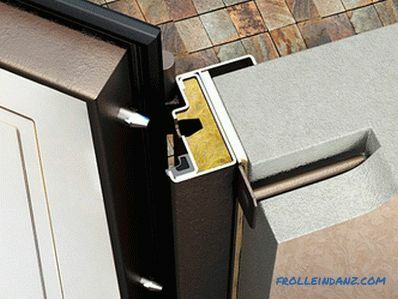 To increase the strength of the door, the best option would be to use not two metal sheets, but one external one, 3 mm thick. 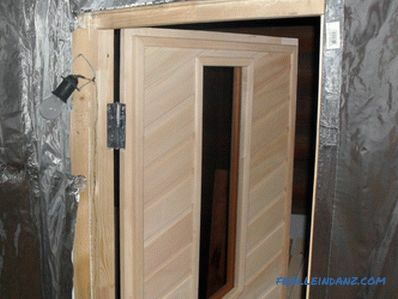 This will increase the overall strength of the structure and reduce its weight, and hence the load on the door hinges. Their task is to resist the torsional loads that occur during a rough force break-in, when attackers try to bend the upper or lower part of the door leaf, or press door frame. combined, using a longitudinal and transverse, arrangement. To give the door leaf maximum strength, stiffeners must be combined, i.e. located both along and across the door leaf. An example of such a door you can see in the image above. What are Chinese door manufacturers sinning? First of all, it’s not even the quality, but the thickness of the metal, which in some doors is good if it reaches 1 mm. 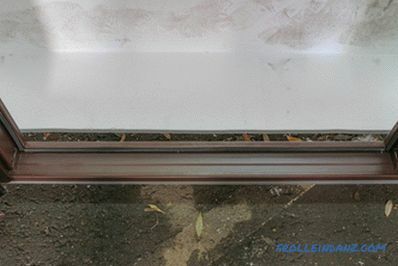 It is very simple to check this - it is enough to try to push through the metal sheet of the door leaf, if it is at least slightly deformed, then there can be no protection. Accordingly, low-quality "Chinese" can be recognized by weight - such a door will "tighten" by no more than 40-50 kg. Indirect signs of a bad door, this is too bright shiny paint and a low position of the peephole. 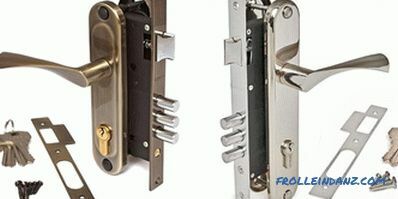 The next problem of Chinese doors is the low reliability of the locking system - their locks of unknown manufacturers often “play” when the bolts fly out, and it is almost impossible to find accessories for them. Cellular cardboard is sometimes used as a filler in such doors, it is understood that in this case it is not necessary to speak about the rigidity of the canvas. 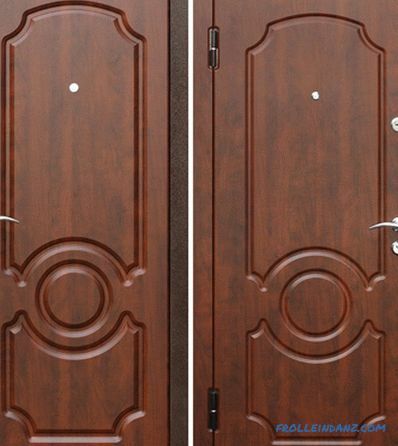 If the price issue is not in the foreground, then before you choose a metal door in you need to make sure that the apartment is not a Chinese fake from unknown manufacturers, which the attackers will open as quickly as a wooden one. High-quality insulation protects the room from unwanted sounds, odors and heat leaks. In addition, the complex installation of insulation materials improves the appearance of the door, as it provides for the finishing of the outer leaf and high-quality execution of slopes. The first isolation stage is the filling of technical voids inside the door between the stiffeners. Most often mineral wool is used for this, which has a complex effect - it works as a heat and sound insulator, does not burn and is environmentally friendly. Some manufacturers use polyurethane foam or polystyrene foam as a filler. 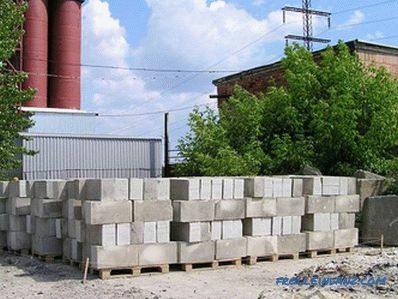 The advantages of these materials include the fact that they are not able to accumulate moisture. However, if you choose the door to the apartment, then for you it will not be so relevant.The disadvantage of these heaters is their fire risk. 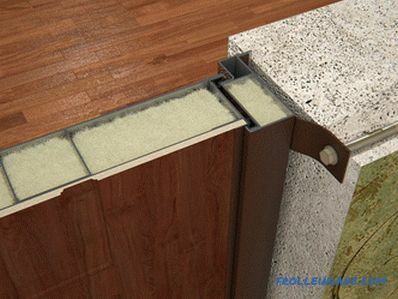 The advantages of using these materials to fill the voids of the door is that it is sufficiently dense materials and the door in which they are installed, there is no drum effect, if you knock on it. 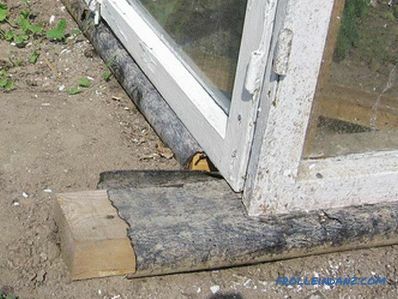 The second point related to insulation is the presence of a quality seal around the entire perimeter of the door. Rubber or silicone seals - they not only increase sound insulation, but also prevent odors from entering the apartment from the corridor, which is especially important in the presence of smoking neighbors. Choosing a door you can stumble upon offers with one, two or even three contours of seals. The last option on the assurances of sellers necessarily guarantees complete protection from everything that you can think of, but if you listen to the practitioners, they unanimously say that one circuit will perfectly cope with the task if it is made of good material, and the door leaf itself is well fitted. Even two recommend to put only for insurance - rather "just in case" than for serious need. Finishing slopes. Whatever the door is wonderful in itself, but if after its installation there are cracks in the wall, then smells and sounds will freely pass through them into the apartment. 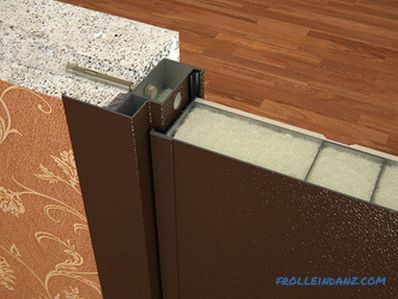 A well-made door and insulation dampen most exterior sounds, but installing it in an apartment should not be expected to be completely soundproof, since there are so-called structural sounds transmitted in solid matter, in particular walls. Therefore you should not expect from the door that it completely muffles the noise of the elevator or cope with the external sounds with the "bare" walls. But if before that you had a wooden door, then by putting a high-quality metal door, you immediately feel comfortable in terms of isolation from the outside world. The weak door leaf or the lock (even two), made of incomprehensible materials, will equally be the weak link in the protective properties of the whole structure, which is tasty for the burglar. For a residential door, you need a dead lock, the mechanism of which fits inside the door leaf. Suspended or overhead counterparts are not reliable and their use must be abandoned immediately. 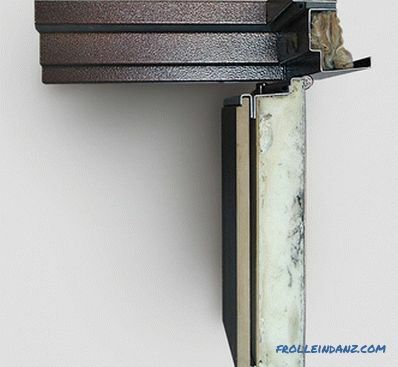 The latch greatly simplifies the operation of a modern door, and in particular its locking. If the latch is not, then to turn the lock, the door leaf will have to pull or push. Two questions are taken into account here - security and forethought. In the first case, the fact that the two locks is a double job for a cracker is taken into account - two sets of different tools, twice as long a period of time for opening, and accordingly increased chances to get caught on the hot one. The second reason is a banal reinsurance - if one of the locks fails, then it can be slowly repaired or replaced, using the other at this time. If you install two locking mechanisms, then there is no point in acquiring the same types of them - if a thief can open locks of a certain design, then the time loss for it would prove irrelevant. For this reason, it is recommended to install mechanisms of different designs - cylinder and suvaldny. Cylinder is considered more difficult for an intelligent autopsy - its secret part consists of many so-called pins. To lock the lock, they must be arranged in a specific order. 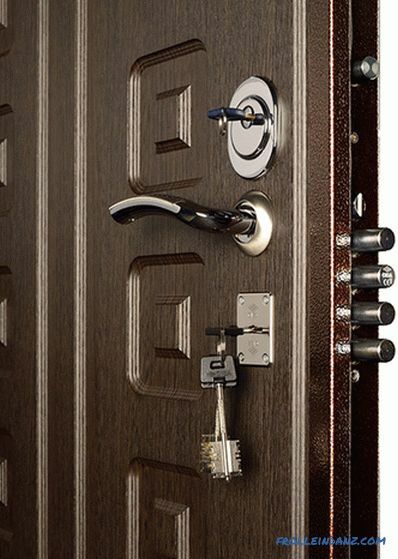 The disadvantage of the cylinder lock is the relative fragility and location - the secret mechanism "looks" outside the door leaf, which is why you can simply try to knock it out. A level lock consists of thick plates called levers — hence its name. It is easier to open such a lock, but hacking is much more difficult, since its mechanism is completely hidden in the thickness of the door. Of course, everything is not as simple as it seems at first glance. Manufacturers of locks are constantly improving their devices, making them all the more reliable, but the rule that everything that is closed by one person can be opened by another is still valid. As a result, deciding which entrance door is best to install in the apartment, it is strongly recommended to choose a model with two locks of different designs. From the skills of a professional, this does not give a 100% guarantee, but small crooks, which are actually the majority, will scare away unequivocally. Each of them is intended to complicate the task of a potential intruder, so if the security issue comes first, you should find out which of the above is included in the door kit and what can install separately. Door hinges . 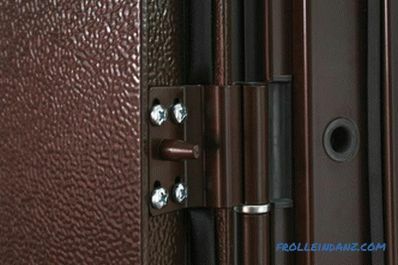 Hinges that are equipped with doors can be hidden or external. External hinges are welded to the door leaf and the rack box. 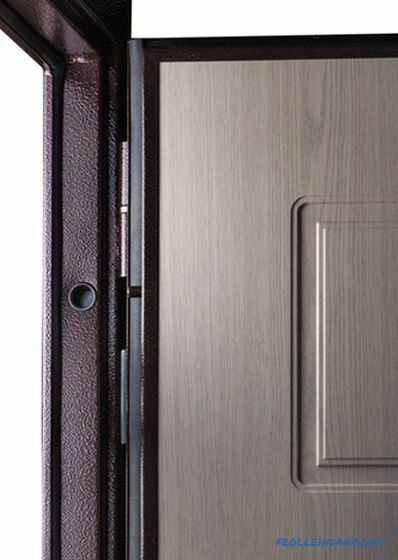 Since the door is heavy, the hinges are very powerful and some believe that it spoils the appearance of the door. According to the sellers, the main disadvantage of external loops is that anyone has access to them and can be easily cut, and hidden loops are free from this disadvantage. They increase the cost of construction. Since the hinges are hidden in special bosoms, the useful door opening is reduced. Doors equipped with such hinges have a smaller opening angle. 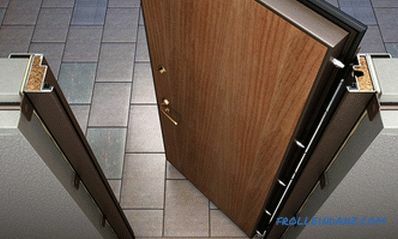 There is a high probability that as a result of excessive opening of the door, at a greater angle provided for, the door frame may be deformed. Seats for hidden loops somewhat reduce the rigidity of the frame. Cutting open-type loops is not so easy. 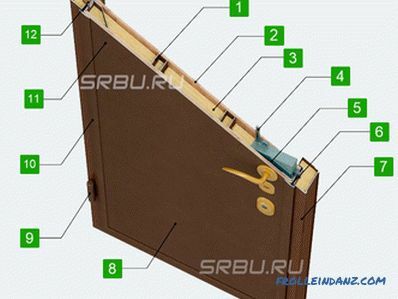 In addition, all doors with such types of hinges are equipped with anti-pins, which do not allow to remove the door, even with cut loops. Therefore, the type of hinges will not affect the breaking of the door. It will be much easier to open the lock than to create so much noise when cutting loops. Anti-detachable pins . Located in the door leaf and go inside the door frame. They are needed in case of a forceful hack — if an attacker even manages to cut the hinges, he cannot pull the door leaf out of the opening. Night Stop . The simplest mechanism, mounted on the inside of the door leaf and actuated manually. There is no access to it outside, therefore no tool will help the hacker. Door Viewer . There is only one requirement - a wide viewing angle that allows you to see everything that happens outside. Opening outward or inward . Obviously, the first option is preferable, since the canvas opening inwards can be squeezed out with a jack. If, for any reason, the opening still has to be done inside, it is advisable to install a second additional door. Its task is not only to give the door surface an appropriate look - the exterior finish should be as vandal resistant as possible and withstand exposure to solar ultraviolet radiation and precipitation. For this reason, for outdoor doors you can not use coatings of wood-based materials that can collect moisture - particleboard, MDF and the like. The steel sheet is cleaned and degreased. In the right places, the bases of the overlays are glued onto it. 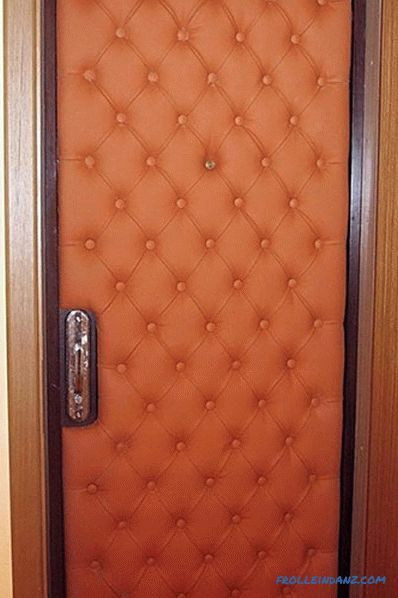 Foam rubber or similar material is laid on the door, and there is leatherette on it. The upper side of the pads presses the leatherette against the door leaf. At the same time, the free portions of the foam rubber stretch the dermatin. Between the overlays, you can stretch the wire - craftsmen have invented many schemes for various patterns. 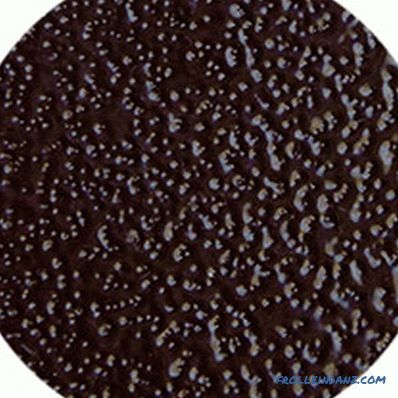 The main disadvantage of leatherette is weak resistance to mechanical damage, especially from sharp objects. A relatively new type of finish, using which wood panels are used or plastic materials, up to 20 mm thick. Their main advantages are simplicity of installation and a wide range of colors and shades, than can not boast of dermatinic materials. 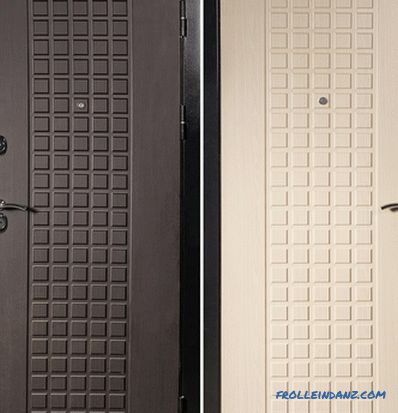 In the domestic market, first of all, plastic panels appeared that decorated Italian and Spanish doors, and with the development of the market, local manufacturers began to produce them. Wooden panels are positioned as products of elite class, the corresponding value - with the appearance of these doors are difficult to distinguish from those made of natural oak, alder or pine. 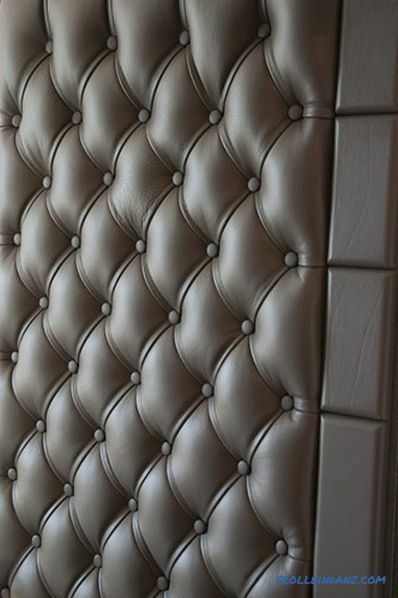 By the look decorative panels can be with a flat or three-dimensional pattern. 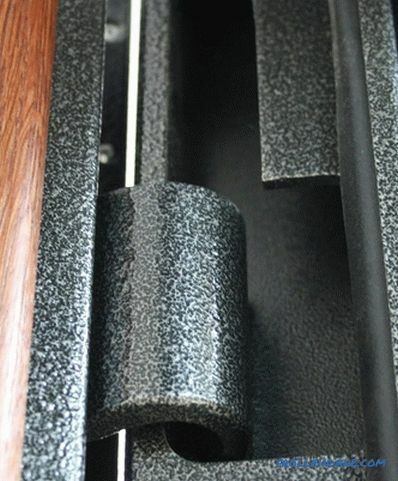 In the first case, thin plastic or MDF is used, which are covered with a film.For bulk take plywood, high-quality MDF or a natural array, on which the necessary pattern is cut out with a router, and then the panel is covered with film, lacquered and tinted, if it is an array. The lack of panels is the same as that of dermatin - low vandal-resistant. 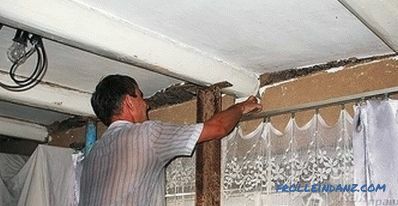 To increase their strength, an additional layer of plastic is sprayed onto the surface, but this does not completely solve the problem, and the cost of this procedure is quite high. The painted surfaces have a characteristic look - it seems that they were painted, the paint was beaten with a hammer, and then varnished, but the drawings are quite discreet and beautiful. This effect is obtained due to the presence in the composition of the aluminum powder. The paint structure masks scratches and irregularities, and therefore does not require priming. The paint adheres well to the surface and dries quickly. Easy to handle - it is already sold ready-made, ready to use. 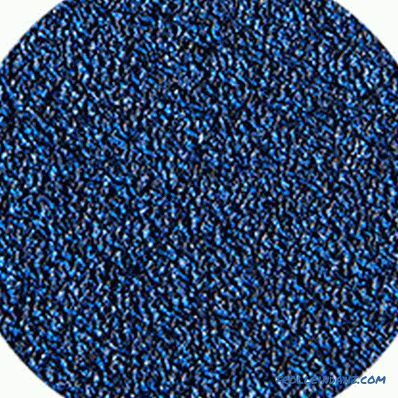 The surface coated with hammer paint becomes airtight, resistant to various weather conditions, ultraviolet radiation, aggressive fluids, mechanical stress, vibration and temperature changes, which gives it vandal-resistant properties. Even if the store has already attracted a specific entrance door to an apartment, which one will finally have to be decided with the manager in the department. This is an inevitable evil, or vice versa, if the consultant is competent and competent. In any case, he can and should ask all the questions of interest, tell about any doubts about the quality of the door as a whole and its parts that appeared during its selection, ask for a preliminary calculation of the installation cost. By the way a person answers all the questions asked, it is possible to form an opinion not only about himself, but also about the company as a whole. People are not born technically savvy - if the seller really has extensive knowledge, he competently answers questions and finds answers to objections, then he has been working for a long time in his place and regularly undergo training for advanced training. This indicates a responsible approach to the company to work with clients, and therefore, with a high degree of probability, to the process of production of its products as a whole. But if everything is exactly the opposite - the consultant is just in the store for a tick, you may not even know the names of the door components and get lost with basic questions about the cost and installation time, then at least the implementation of the company manufacturer is not well established. Of course, it may be that you have to communicate with a newcomer, but serious sales people first of all teach the "students" not to lie about the product, and if he doesn’t have enough knowledge, then invite more competent people to talk to the customer specialist. Trivial questions about the operating time of a manufacturing company in the market, where it came from and how it developed, will help suggest the actions of its employees in the event of a breakdown or detection of a component. In addition, you should not be ashamed to directly ask questions about warranty service - where and how it will be produced, within what time frame, who is responsible for it, and what could be the reasons for refusing a guarantee. All these points need to be clarified “before” as the door is acquired and installed, because then, if an order was made with one-day workers, there is most likely no place to complain. An important moment - besides logical reasoning, it will be useful to trust your intuition. If, while communicating with consultants, a steady impression is created that “something is not right”, then it is better to postpone the purchase and study the catalogs at home in a relaxed atmosphere. If the company does not have directories that you can explore at home or the site where they are posted - something is wrong with it.